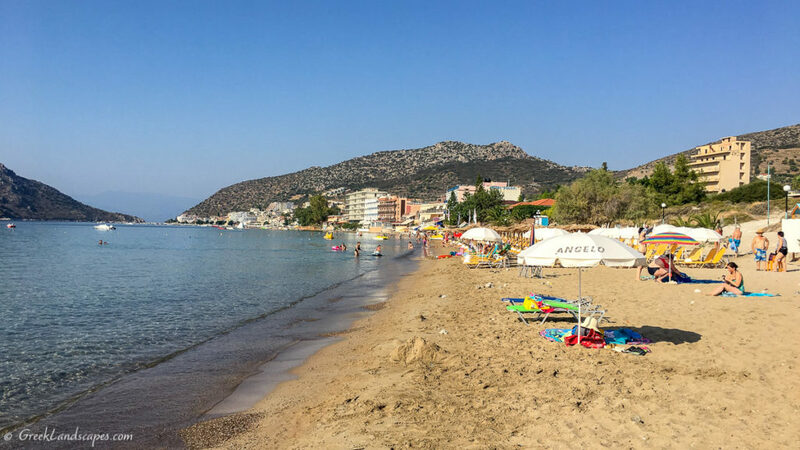 Nafplio is not known as a swimming destination, but it has some enjoyable swimming spots in its vicinity, including Arvanitia beach right on the edge of town, and the popular Tolo beach. Arvanitia beach is conveniently located within walking distance from Nafplio old town. The proper beach is a single shingle-lined patch, framed by flat rocks and a cafe/bar with parasols. The beach is a good place to cool off in inviting waters if you are in the area. Click here to see it on the map and to get directions. RV / Camper Accessibility: The parking lot is a bit too tight once it’s filled with cars after 10:30 am. Even if you find parking earlier in the day, it might be impossible to find room to get out once it’s packed with cars. Snorkeling: The rocks around the beach are a good place to explore with a mask. 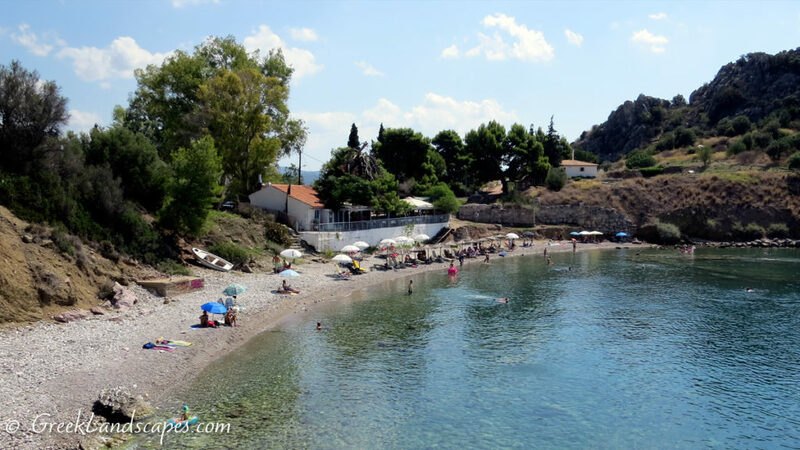 Notes: Arvanitia beach is very nice for swimming if you are in Nafplio town. Despite the monstrous old hotels that have been abandoned and rotting within eyesight, the beach has a charm that you rarely find in beaches so close to towns. The beach is frequented by locals and changes character as the day goes by. In the morning, the beach is completely shaded so it is filled with small crowds of older bathers who bask in the calm waters, or do laps. After 10:30, when the sunlight bathes the entire beach, families and small children begin to blend in. Later, a more youthful crowd begins filling the tables and parasols of the adjacent beach bar, while the morning bathers disipate. In the summer the little parking lot behind the beach is packed with cars by 11:00 am, but it’s so close to Nafplio town, you can park anywhere and walk to it. The shingle-lined beach is not a great attraction, but it’s functional and you can plant your parasol there if you don’t want to sit at the cafe. At the same time, the flat rocks next to it are a good place to stretch a towel. But shade on the rocks would be almost impossible. There is a metal staircase to allow bathers who dive from the rocks to get back out of the water. 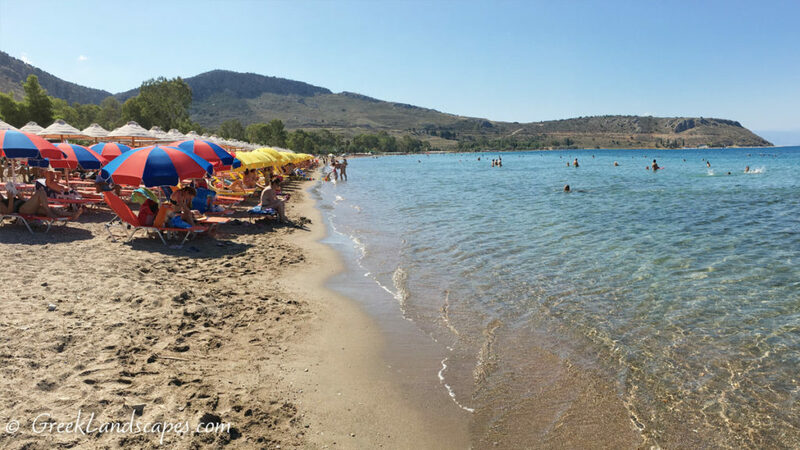 Arvanitia beach is also a nice place to cool off after visiting Palamidi fortress on the rocky hill above it. Asine beach is an expansive patch of sand near the Ancient Asine (Kastraki) archaeological site. We did not swim there (chose the smaller beach on the west (see below), but it looks like a nice place to swim after a visit to the archaeological site. Location: Agrolis, near Nafplio, Peloponnese. Access: Good = Paved road all the way to beach. Ample parking behind the trees. Amenities: None. There is nothing within walking distance, so bring your own water and food. RV / Camper Accessibility: The road to the beach is narrow, but not impossible to drive an RV through. At the beach, there is ample space for parking and even camping. Notes: You may combine Fournoi beach with a visit to Franchthi cave nearby. The hiking path to the cave starts at the southern end of the beach. It takes about 15-20 minutes to reach the cave from there through an easy footpath. Access: Good = Paved road all the way to beach. Ample parking on the road and under trees. Amenities: Several beach bars provide food, drinks, and parasols on the beach. Accessibility: Cart and runway for people with special needs is available. RV / Camper Accessibility: There is ample space for parking under trees, and it’s easy to drive to even for large vehicles. It looks like a good place to park for the day. Even though we saw people sleeping on the beach and a couple of tents, signs prohibit free camping. Water Sports: some paddle boats but not much else. However, this changes from year to year, and given the popularity of the beach in the summer, we would not be surprised to see more water sports available in the near future. 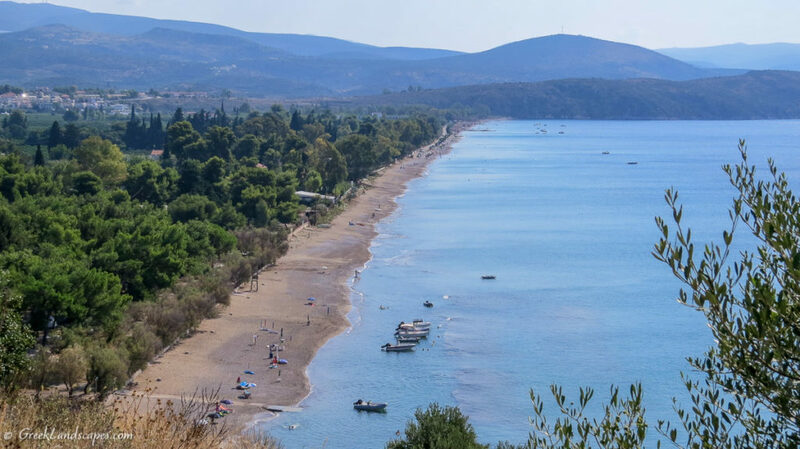 Notes: Karathonas beach is located near Nafplion town. You can reach it by car in about 10 minutes, and it’s a good place to swim if you are in the area. Its vast size allows crowds to be spread out. Numerous cafes and bars line up the Karathonas beach, offering parasols, drinks and food. The beach berm is a mixture of sand and pebbles, and it doesn’t look particularly attractive. But the water was excellent during our visit. The sandy seafloor slopes gently, so it’s a good beach for young children, and there are trees in the perimeter that offer shade in case you don’t want to sit at a cafe parasol. Karathonas beach also has a special cart and runway for accessibility to the sea for people with special needs (handicap accessibility). Overall, it’s a nice option for swimming if you are in the area. Asine beach is a little cove right next to the ancient Asine. It is a small beach, lined with shingle, but it’s very quaint with the ancient walls of the archaeological site on its edge. Amenities: Parasols are rented by the adjacent cafe. RV / Camper Accessibility: Not much space to park, but it’s not impossible. The nearby Marathons beach and the large camping ground there is a better option. Water Sports: None. The nearby Tolo beach is a better option. Notes: Asine beach is a picturesque cove and it is a nice place to dip after hiking the archaeological site on the adjacent hill. Otherwise, we don’t think it’s worth a special trip just to swim there. 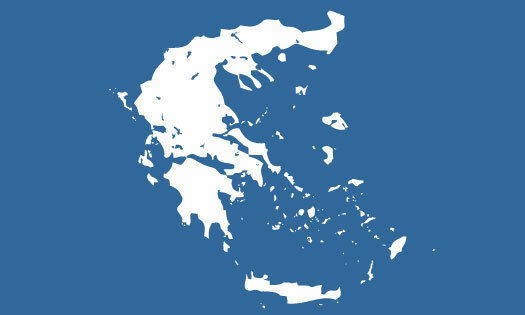 Both the nearby Tolo and Karathonas beaches are better options for swimming and sunbathing. The large pebbles and rocks at the edge of the beach make it difficult to get in and out of the water. Beach shoes are recommended. The archeological site entrance is about 100 meters from the beach, and entry is free of charge. You can hike the archeological site in about 20 minutes. It’s an easy hike through cleared path and stairs. We recommend you do the hiking early in the morning, before dipping in the beach waters. A unique feature of the beach is that the defensive walls of ancient Asine line up the southeast end of the beach. Access: Good = paved road all the way to the beach. Parking near the beach. Parking near the beach, but parking spots in the town of Tolo are hard to find parking in the summer. Amenities: The town of Tolo is within walking distance. RV / Camper Accessibility: Not a good place to park an RV. Your best bet is to park at the beginning of the beach before you get tangled into the narrow streets of the town. Water Sports: Lots of watersport options available form a plethora of venues. Snorkeling: The sandy bottom might not be of much interest. Notes: Tolo beach gets very crowded during the summer months. It might have paid a high price for its own beauty. Over-development has brought some huge, and mostly unattractive, construction projects right onto the beach. 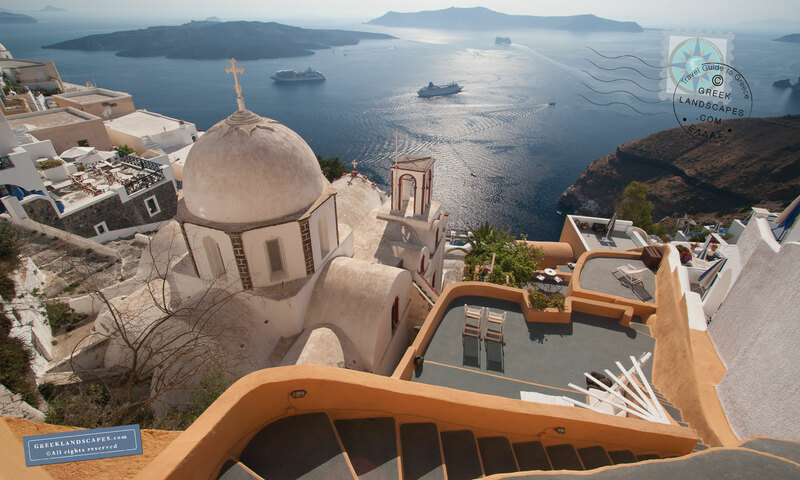 Hotels, restaurants, sun beds, kiosks, water sports, along with sounds and contraptions of every size and kind make it difficult to even decipher the landscape. Having said all that, if you are in the area, the beach is still invading enough even with the enormous crowds. But if you like crowds, Tolo is a great place to swim if you are in the area.